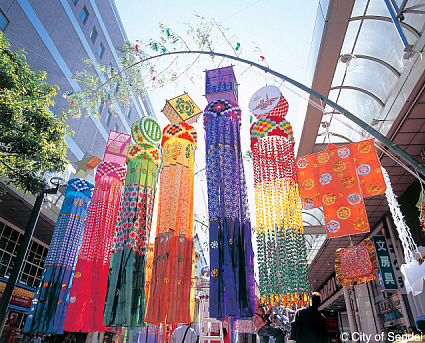 The Sendai Tanabata Festival(仙台七夕まつり) is being held in Sendai City, Miyagi Prefecture from August 6th to 8th. 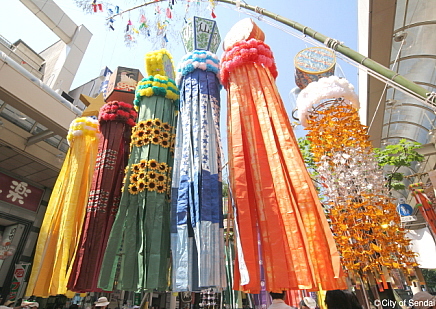 Date Masamune (伊達 政宗,1567-1636), the first lord of the Sendai Domain, backed up Tanabata(the star festival) to pray for a good harvest and improve people's skills in the Edo Period. 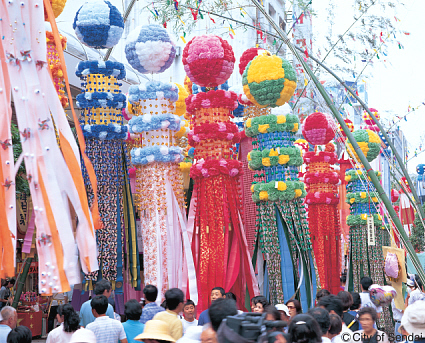 The festival came to be held on August 7th after the Meiji era, but it declined gradually. 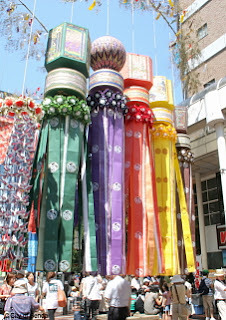 Volunteers from merchant in Sendai brought back the festival in 1928. 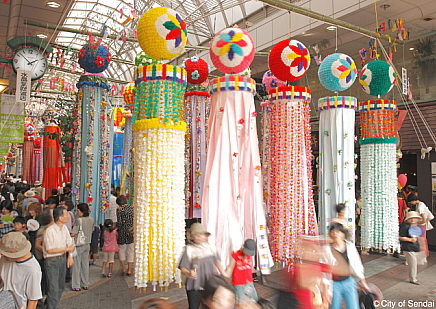 The shopping mall in Sendai is decorated with about 3,000 bamboo with streamers(吹流し,fukunagashi) representing weaving yarns of the Weaver, strips of paper(短冊,tanzaku) to improve people's learning and writing, paper garments(紙衣,kamigoromo) to transfer people's misfortune and disease onto, or to improve people's sewing, paper cranes(折鶴,orizuru) to pray for a long life, cast nets(投網,toami) to pray for a bumper catch, drawstring bags(巾着,kinchaku) to save money by economizing and garbage boxes(屑籠,kuzukago) to take care of what one has and keep a clean house. 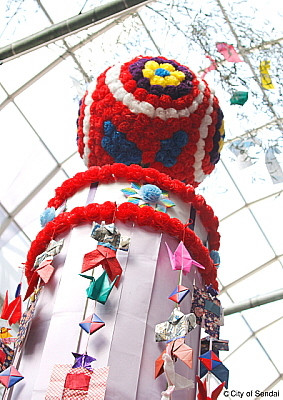 strips of colorful paper hung from bamboo branches, gorgeous streamers, a streamer with paper cranes, a paper garment(kimono), a drawstring bag hung from the underside of the garment, a white paper cast net on the far right. ﻿People including earthquake and tsunami victims wrote their wishes on strips of colorful paper and folded paper cranes in the hope of reconstruction. Their wishes include sad ones such as seeing their family members again and returning home. The musicians from the Gion Festival in Kyoto and the performers from the Hakata Dontaku Minato Festival took part in the festival for the first time. The dancers from the Awa Odori Dancing Festival in Tokushima, a sister city of Sendai, performed at the festival. The Gion Festival in Kyoto started to counteract the epidemic spreading across Japan in 869 when massive earthquake and tsunami hit Sanriku area. 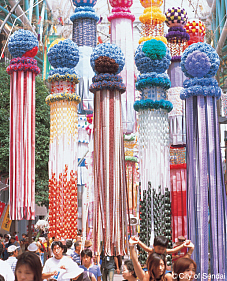 Kenka Tanabata(けんか七夕) is a type of the star festivals held on August 7th in Kesen-cho in Rikuzentakata City, Iwate Prefecture. Two four-ton floats crash into each other. The festival has a history of over 900 years. Three of four floats were swept up by the tsunami, so the townspeople pulled the surviving float against each other this year. 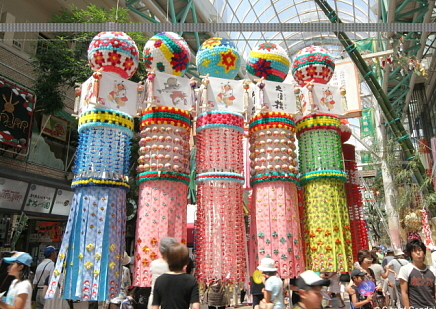 In Takata-cho in Rikuzentakata City, 12 tanabata floats parade through the town. Nine of 12 floats were swept up or destroyed by the tsunami. The surviving three floats paraded through the shattered town. In some areas of the town, all of homes were wept up by the tsunami. 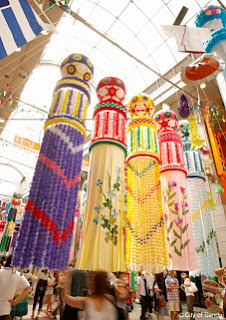 Those areas are due to disappear from the town, so townspeople in those areas participated in the festival. 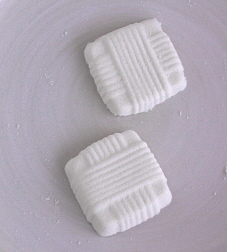 dry confections in the shape of bobbin. 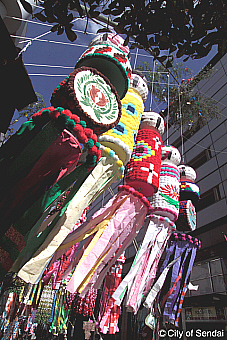 Bobbins were offered to improve sewing skills at the Star Festival.